The Carolina Panthers reached the playoffs in just their second year of existence in the 1996 season and hosted the Dallas Cowboys, defending NFL Champions, on January 5, 1997. Coached by Dom Capers, the Panthers benefited from an outstanding defense that featured linebackers Kevin Greene, who led the NFL with 14.5 sacks, Lamar Lathon, who contributed another 13.5 sacks, and Sam Mills, still a Pro Bowl-quality performer at age 37. 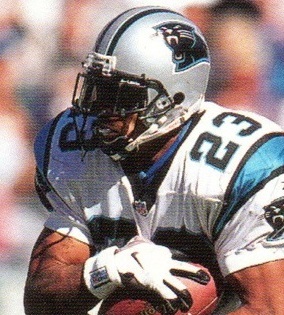 The conservative offense was directed by second-year QB Kerry Collins and received unanticipated production from journeyman RB Anthony Johnson (pictured above). Reliable TE Wesley Walls led the receiving corps. Carolina won its last seven games to top the NFC West at 12-4, edging out the 49ers, who the Panthers swept during the season. The Cowboys were coached by Barry Switzer for the third season and had won three Super Bowls in the preceding four years, beginning under Switzer’s predecessor Jimmy Johnson. The offense was still led by QB Troy Aikman, RB Emmitt Smith, and WR Michael Irvin, and the defense contained dynamic CB Deion Sanders. But there had been disarray in Dallas, starting with Irvin missing the first five games due to a drug suspension by the league and TE Jay Novacek being lost for the year with a back injury. The Cowboys stumbled out of the gate, losing three of their first four games, before winning four straight on the way to a 10-6 record that placed first in the NFC East for the fifth straight year. They easily defeated Minnesota in the Wild Card round, but DT Leon Lett was missing for the postseason due to a drug suspension and DE Charles Haley due to injury. Furthermore, there had been sexual assault accusations made against Irvin and OT Erik Williams during the week preceding the game against the Panthers that provided an additional distraction (the charges ultimately proved to be unfounded). There were 72,808 fans in attendance on a 60-degree day at Ericsson Stadium. 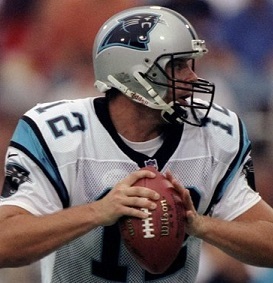 The Panthers had the ball first but, after reaching midfield, Kerry Collins was intercepted by SS Darren Woodson. Troy Aikman completed passes to Michael Irvin for 22 yards and WR Kevin Williams for 17 while Emmitt Smith plugged away on the ground, and the Cowboys put the first points on the board with a 22-yard Chris Boniol field goal. However, Irvin suffered a broken collar bone when tackled by Lamar Lathon following his reception and was lost for the remainder of the game. Carolina responded with a 68-yard drive in six plays. Collins (pictured below) threw to WR Willie Green for 22 yards and a seven-yard completion to WR Mark Carrier gave the Panthers first-and-goal at the Dallas one, from where Collins connected with Wesley Walls for a touchdown. John Kasay added the extra point for a 7-3 lead. A short series by the Cowboys ended with a punt and, in a drive that stretched into the second quarter, the Panthers advanced 42 yards in 11 plays. Collins threw to Green for 13 yards on first down, hit Green again for eight yards on a third-and-nine play, and converted the resulting fourth-and-one situation by carrying himself for the necessary yardage. Another Collins pass, to RB Winslow Oliver, picked up five yards on a third-and-two play and the possession ended with Collins throwing to Green for a 10-yard TD. Kasay’s point after made it a 14-3 score. Dallas came back with a long series of 14 plays that traveled 73 yards. 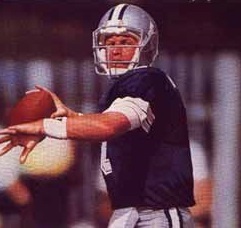 Aikman completed six passes, the longest to Williams for 15 yards to convert a third down and the last to FB Daryl “Moose” Johnston for a two-yard touchdown. The attempt for a two-point conversion failed but the Carolina lead was narrowed to 14-9 with 4:19 remaining in the first half. The Panthers went three-and-out on their next possession but gave up two points when the snap from punt formation sailed over Rohn Stark’s head and the punter was obliged to fall on the ball in the end zone for a safety. Deion Sanders returned the resulting free kick 28 yards and Aikman immediately moved the Cowboys into Carolina territory with a pass to Williams for 12 yards, but three plays later he was picked off by SS Chad Cota, who returned it 49 yards to the Dallas 27. Kasay kicked a 24-yard field goal and the Panthers led by 17-11 at halftime. The Cowboys had the ball first in the third quarter and had to punt, but retained possession when Oliver fumbled the kick and Johnston recovered for Dallas at the Carolina 16. Aikman threw to Williams for 11 yards but, after reaching the three yard line, the Panthers held and the visitors settled for a 21-yard Boniol field goal that made it a three-point game. With Anthony Johnson leading the way on the ground, the Panthers drove from their 28 to the Dallas 22 and Kasay kicked a 40-yard field goal. The Cowboys punted following their next series and once again Carolina advanced to a field goal by Kasay, again from 40 yards, that made the score 23-14 early in the fourth quarter. Dallas came back with a long drive that covered 78 yards. Aikman completed four passes, all under ten yards, and Sanders, lined up at wide receiver on offense, gained 16 yards on a reverse while Smith had a 25-yard run. However, Sanders was lost with a head injury and once again the Cowboys couldn’t reach the end zone and settled for another Boniol field goal that covered 21 yards. A short series by the Panthers following a 51-yard kickoff return by WR Michael Bates resulted in a punt and Dallas, down by six points, was pinned back at its two. The Cowboys reached their 37 before Aikman threw a pass that was intercepted by FS Pat Terrell, who returned it 49 yards to the Dallas 19. Carolina kept the ball on the ground and Kasay made it a nine-point game with a 32-yard field goal as the clock showed 3:44 remaining in to play. On the third play following the ensuing kickoff, Sam Mills intercepted an Aikman pass to clinch the 26-17 win for the Panthers, who were able to run out the clock. Dallas had the edge in total yards (244 to 227) and first downs (21 to 18). However, the Cowboys failed to take full advantage of scoring opportunities, settling for three field goals rather than touchdowns inside the Carolina five, and turned the ball over three times, to two by the Panthers. Kerry Collins completed 12 of 22 passes for 100 yards and two touchdowns while being intercepted once. Anthony Johnson rushed for 104 yards on 26 carries and Willie Green led the Carolina receivers with 5 catches for 53 yards and a TD. John Kasay was successful on all four of his field goal attempts. For the Cowboys, Troy Aikman (pictured at right) was successful on 18 of 36 throws for 165 yards and a TD but also gave up three interceptions. In the absence of Michael Irvin, Kevin Williams caught 6 passes for 89 yards to lead the club. Emmitt Smith gained 80 yards on 22 rushing attempts but was consistently stopped inside the five yard line. Carolina advanced to the NFC Championship game and lost to Green Bay (similarly, the other 1995 expansion team, the Jacksonville Jaguars, reached the AFC title game). The Panthers were unable to sustain the quick success, dropping to 7-9 in 1997 and not reaching the playoffs, or posting another winning record, until 2003. For the Cowboys, the defeat marked the end of a six-season period in which they were an elite club. They fell to 6-10 in ’97 and, while they returned to the postseason in 1998 and ’99, they were defeated in the Wild Card round both times.